I don't usually start many (or even any) seeds inside, for a variety of reasons. I don't believe in extreme climate control, preferring to enjoy the temperature swings of spring, so tender tomato seedlings on my windowsill are as likely to get stunted as they are to thrive. Plus, even our south-facing windows don't really provide enough light for young vegetables, and I don't want the energy cost of running supplemental lighting. Finally, I don't believe in buying potting soil, and there's only so much stump dirt to go around, so it usually goes to my dwarf citrus trees. 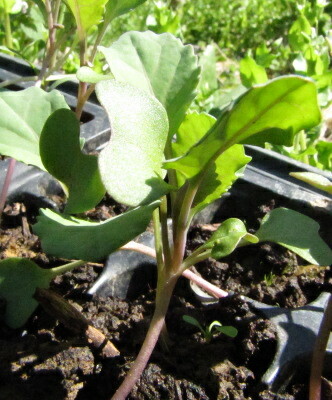 Instead, I start broccoli, cabbage, and tomatoes in quick hoops a month or so before their outside planting dates. The seedlings get off to a slightly slower start than those of our neighbors, but produce very well --- in fact, I think we get more tomatoes off our vines than folks do who buy big starts from the store since our tomatoes are never shocked. 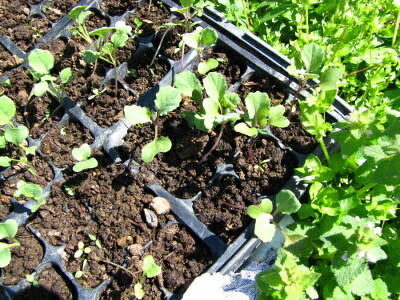 (My seedlings are small when I transplant them, and I generally get all their roots in a big gob of dirt that I move with the young plant.) My method is very low work since the seedlings are right in the earth and exposed to the sun from day 1, which means they don't need to be waterered, turned, potted up, etc and I don't have problems like spindly growth, damping off, and insects. I'm willing to eat my first tomatoes a week later than my neighbors do if it means less worrying and a bigger harvest in the end. There is something to be said for starting transplants inside for a no-till garden. 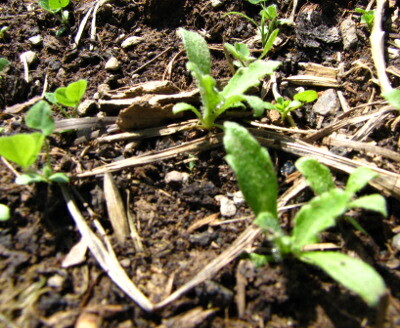 If you don't have to rake back the mulch and expose large expanses of bare ground, there's less weeding work to be done later, which is why Mel Bartholomew's Square Foot Gardening method uses nearly all transplants. For example, I'm going to have to weed this bed of poppies before I mulch it to rip out the clover and other seedlings that popped up from seeds in the compost. I don't think I'm ever going to follow Bartholomew's lead and transplant things like lettuce, but I'll be curious to compare transplants from my flats vs. quick hoops this summer. Maybe my garden needs a little of both methods. Our chicken waterer makes it easy to leave town for a long weekend without worrying about your flock. Jennifer --- Thanks for sharing! I think the micropore tape is probably a lot like the grafting tape they make exactly for that purpose. If I was going to buy any grafting supplies, that tape would probably make the cut --- it's very easy to use and works well. I am an avid Square Foot Gardener, but I only transplanted tomatoes, onions, and basil this year. Everything else (yes, lettuce) went straight into the beds. I'm much more likely to put up a hoop over one of my boxes to get an early start as well. I do, however, have the advantage of being right on the edge of zone 8, so my growing season is already way longer. We haven't had a frost in the past month and I'm not expecting one in the next three weeks either (when our frost free date happens). Jessie --- You might try direct-seeding basil as well. I always just plant it out around the frost-free date, and it produces very fast. I like to cut it the first time when it's just two or three inches tall to get it to branch out into a bush, and that happens pretty quickly. Of course, I mostly want basil when the tomatoes are producing, so I don't feel the need to jumpstart its season the way I might if I used it in non-tomato recipes.